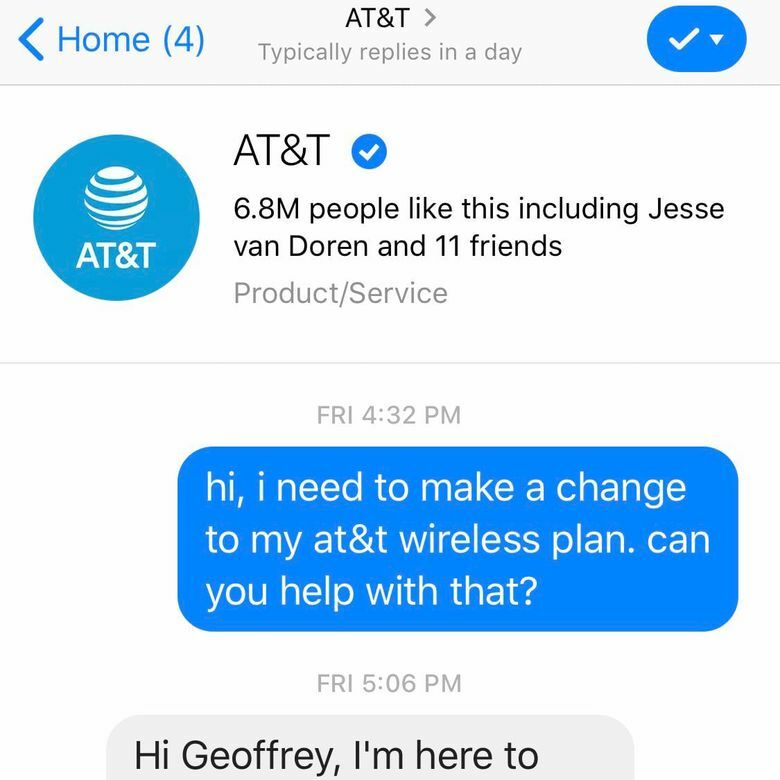 A Facebook Messenger chat with AT&T helped our tech columnist fix a problem with his account. (Washington Post photo by Geoffrey A. Fowler). R.I.P. 1-800 numbers and hold Muzak. Chat and messaging apps from Apple, Facebook, WhatsApp and others are more efficient, less painful — and both sides are more likely to keep their cool. All of our representatives are currently assisting other callers. Please stay on the line for two hours of saxophone samba and we’ll answer your call at the exact moment you take a bathroom run. “We see more and more chatting, texting, social media interactions — and fewer and fewer voice interactions every year,” says Jamie Barton, executive vice president of sales and service at AT&T. But since getting hip to chat, I’ve had remarkably useful interactions with AT&T, with Apple to fix a problem with my iMac, and even with Harry & David to send my mom a surprise present. Now I’m believer that before calling, you should let your fingers do some tapping. Voice calls are also a tech problem. 1-800 numbers made it easy for us to call companies — but then so many of us did that it got expensive to staff and manage. (IBM estimates businesses spend $1.3 trillion on 265 billion customer service calls each year.) Overwhelmed companies started hiding their contact numbers and forcing customers to hunt through those telephone trees to find a human. Employees can handle multiple text conversations at once — but only one call at a time. “What this has really delivered is the art of time management,” says Nick Drake, the executive vice president of marketing and digital experience at T-Mobile, which was one the first companies to push big into messaging. His agents use software that triages incoming conversations and puts the most urgent ones on top. Then there’s social media. As Facebook and Twitter have become bigger parts of our lives, companies were forced respond to customer care concerns there. Now some of them welcome it, with dedicated support teams. Back in the U.S., how can you know if a company can be messaged? Sometimes they’ll say so when you call, in directories, online maps and their own apps. On an iPhone, you can find a businesses participating in Apple Business Chat by searching in spotlight or on maps and looking for the speech bubble icon. Where it’s all headed is humans and bots working together. The Philadelphia Phillies this month tested iMessage chat with concessionaire Aramark. In Citizens Bank Park, you could use an iPhone’s camera to scan a QR code on the back of the seat in front of you. That popped up an iMessage chat, which you could use to order drinks and snacks, and then settle the bill with Apple Pay — all without getting out of your seat. We asked industry insiders what they do to get better service. Here are their suggestions. — Before you dial, see if there are better options, including chat, messaging, self-service websites and schedule-a-call services. — Customers receive the fastest support when reaching out at 2 p.m., according to Zendesk. — Be prepared to repeat yourself: Most companies aren’t sophisticated enough to know about the last time you called or to connect you across all their different forms of contact. — If you’re trying to quit a service and get sent to someone for hard sell, just politely say you know it is a win-back line and you’re really not interested in the service any more. — The emergency button is Twitter. You can always tweet at a company, or its CEO — most are looking out for it. Just remember whatever you’re saying is public.